I love my new toy. It is by far the most fabulous piece of kitchen equipment I own. I have periodically made pasta from scratch for several years now, ever since a neighbor looked at me and said “Pasta is so easy…you could definitely do it”. And so I did. My first batch was successful for the most part, but I struggled with rolling out the dough and getting the right texture. A problem I struggled with regularly up until yesterday. I could spend upwards of thirty minutes rolling out the elastic dough and still not achieve the texture and thinness I desired. But no more! 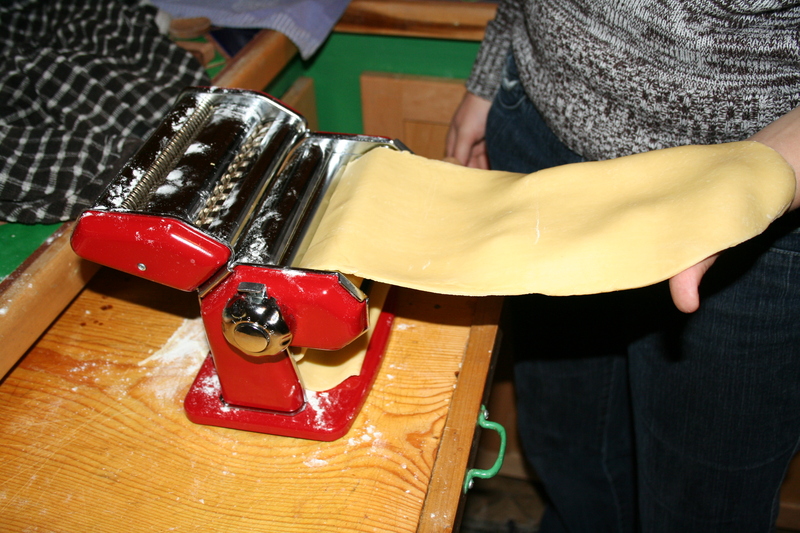 Using the same pasta recipe as always, I was able to create fabulous spaghetti using my new machine. Thin, light and with a beautiful texture, it was by far the best pasta I have had in a long time. 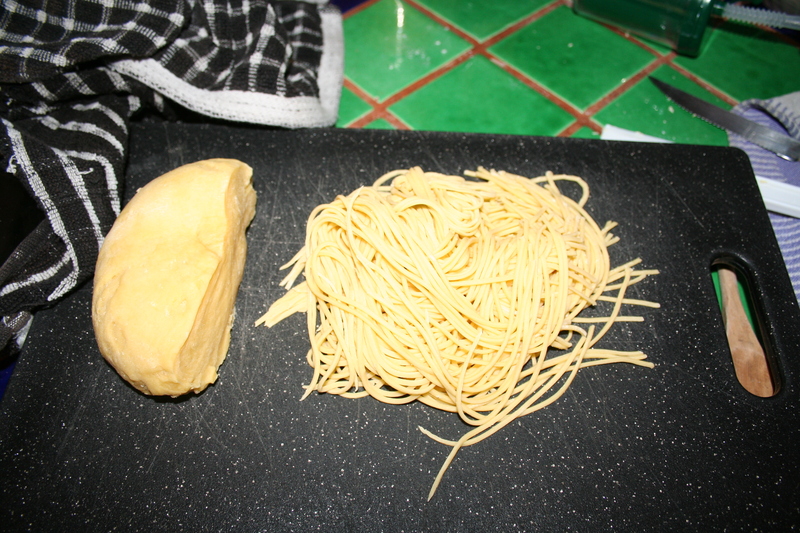 *Depending on your climate, you may not need to add any water to the mixture, however Santa Fe, NM has a relative humidity in the single digits and without a few tablespoons of H2O, my pasta dough dries out and becomes unusable. Once the dough has come together, continue to kneed until you have a smooth, elastic quality. Shape the dough into a ball and cover with a damp towel. Let rest at room temperature for 30-60 minutes. After the dough has rested, you are ready to roll it out. 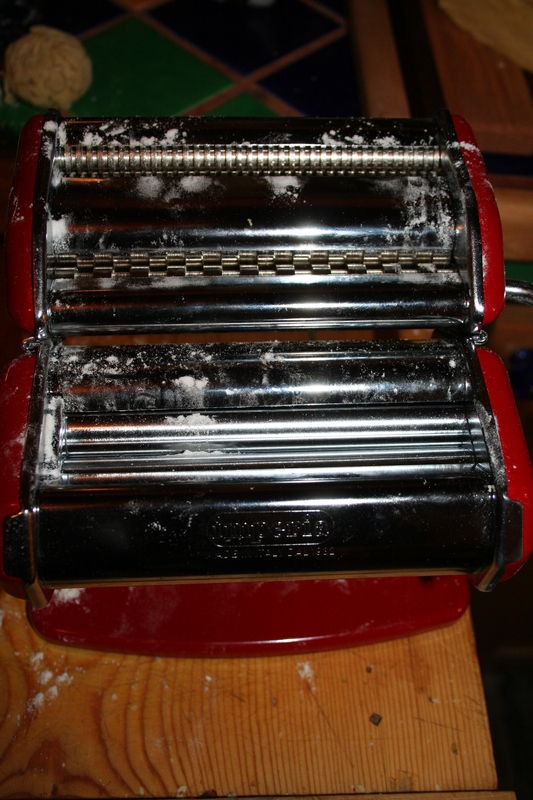 I had to season my pasta maker (by running a small quantity of dough through it to make sure everything was grime free) but once this was accomplished it was a simple matter of flouring the rolly parts and then getting to work. …cover it in home made red sauce, sprinkle some fresh parm on it and voila! The best pasta ever! This post has been my contribution to Cheeseslave’s Real Food Wednesday blog carnival. Check it out for more delicious posts!